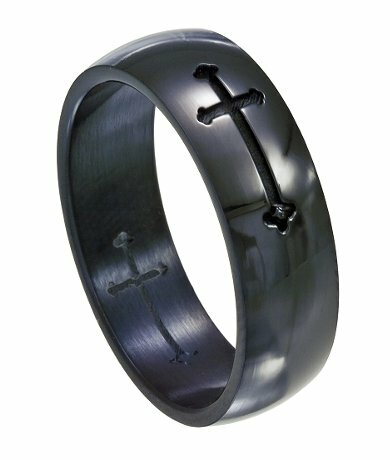 We made our stainless steel crusade cross ring for those who want Christian jewelry that is uplifting and spiritually empowering, but without all the flash.Those of the faith get the best of both worlds with this dark and delightfully broody ring: not only does it invoke emotions of inspiration, but it looks cool at the same time.This smooth, modern ring is intricate enough to catch the eye, but is sleek and classic enough to pair with any outfit, for any occasion. 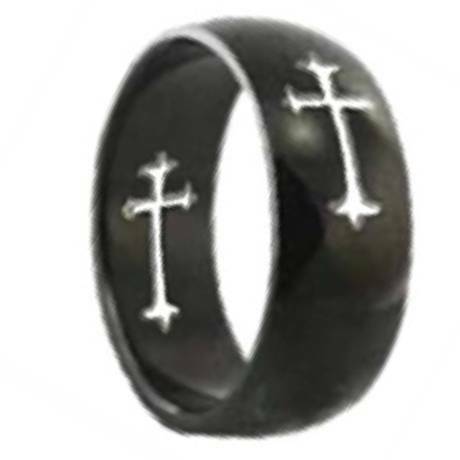 A great alternate choice to the standard cross rings!Note: Comfort Rings are usually 1/2 size smaller. We recommend having your finger measured for a comfort fit ring at your local jewelry store first to ensure the correct fit. Bought this ring for my husband and it is of amazing quality. He wears it all the time and I have yet to see a single scratch on it. Its simple but really nice. I'd recommend it to anyone looking for a high quality band for a really great price. I presented my son the ring as a gift during his ceremony to signify crossing over to manhood. He loves it and wears it continuously. I told him whenever he is in a difficult situation to look at the ring and remember that I and his heavenly Father are always with him. 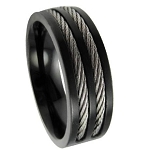 The quality of the ring is excellent and he looks forward to wearing it for a long time. I was surprised to find a quality ring big enough for my sausage-like fingers. It's beautiful, durable, and best of all - it fits. Quality company with quick delivery. I bought this ring for my husbands and i's anniversary and he loved it...the customer service people were so nice 'cause the first ring I had ordered was the wrong size and my husband hated the style. They exchanged it with no problem and it fits perfectly. Thanks JMR! Love the ring, love the price, love the website. Very unique ring, I've gotten lots of comments on it. I've already spotted two more that I'll be getting real soon.